Electric unit (control unit) is integrated with actuator and comprehensively controls VDC function, TCS function, ABS function and EBD function. Brake fluid pressure is controlled according to signals from each sensor. If malfunction is detected, the system enters fail-safe mode. 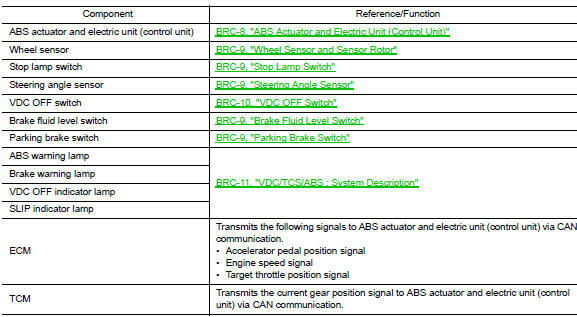 The following components are integrated with ABS actuator. Activates the pump according to signals from ABS actuator and electric unit (control unit). Operates the motor ON/OFF according to signals from ABS actuator and electric unit (control unit). Operates each valve ON/OFF according to signals from ABS actuator and electric unit (control unit). Switches the fluid pressure line to increase or hold according to signals from control unit. Switches the fluid pressure line to increase, hold or decrease according to signals from control unit. Shuts off the ordinary brake line from master cylinder, when VDC function and TCS function are activated. Supplies the brake fluid from master cylinder to the pump, when VDC function and TCS function are activated. Returns the brake fluid from brake caliper and wheel cylinder to master cylinder by bypassing orifice of each valve when brake is released. Temporarily reserves the brake fluid drained from brake caliper, so that pressure efficiently decreases when decreasing pressure of brake caliper and wheel cylinder. Calculates the following information that affects the vehicle. Detects the brake fluid pressure. 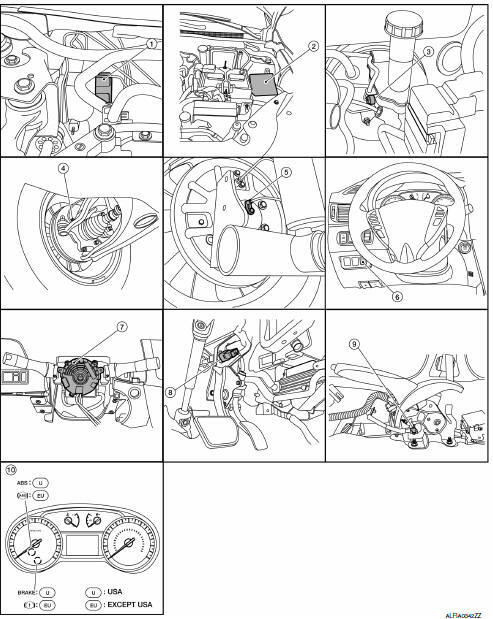 Wheel sensor of front wheel is installed on steering knuckle. Sensor rotor of front wheel is integrated in wheel hub assembly. Wheel sensor of rear wheel is installed on back plate of rear brake. Sensor rotor of rear wheel is installed on rear brake drum. Never measure resistance and voltage value using a tester because sensor is active sensor. Downsize and weight reduction is aimed. IC for detection portion and magnet for sensor rotor are adopted. Power supply is supplied to detection portion so that magnetic field line is read. Magnetic field that is detected is converted to current signal. When sensor rotor rotates, magnetic field changes. Magnetic field change is converted to current signals (rectangular wave) and is transmitted to ABS actuator and electric unit (control unit). Change of magnetic field is proportional to wheel speed. Detects the operation status of brake pedal and transmits converted electric signal to ABS actuator and electric unit (control unit). Detects the following information and transmits steering angle signal to ABS actuator and electric unit (control unit) via CAN communication. Detects the brake fluid level in reservoir tank and transmits converted electric signal from combination meter to ABS actuator and electric unit (control unit) via CAN communication. Detects the operation status of parking brake switch and transmits converted electric signal from combination meter to ABS actuator and electric unit (control unit) via CAN communication. Non-operational status or standby status of VDC and TCS functions can be selected using VDC OFF switch. VDC OFF indicator lamp turns OFF (standby status) when the engine is started again after it is stopped once while VDC OFF indicator lamp is ON (non-operational status).